Catholic Spain was the most closely aligned European nation with the Church of Rome during the age of exploration. 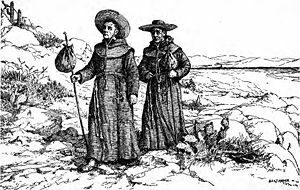 Catholic priests were routinely joined to expeditions into the new world dedicated to conversion of the "heathen", and supported by the threat of the Spanish military. The basic motivations of the Spanish in areas under its control in the western hemisphere, New Spain, as Mexico was called, were simple greed (gold) and the spread of Christianity. Christianity meant Roman Catholicism exclusively. There was no space for the practice of any other Christian practice. This often meant enslavement and forced conversion of the Mexican Indian population. "They ought to make good slaves for they are of quick intelligence, since I notice that they are quick to repeat what is said to them, and I believe that they could very easily become Chirstians (sic), for it seemed to me that they had no religion of their own. God willing, when I come to leave I will bring six of them to Your Highnesses (sic) so that they may learn to speak.."
The Spanish targets, wealth and conversion, were joined at the hip during the formative years of Mexico. However, only Catholic conversion survived as an institution. By 1810, a Catholic priest, Miguel Hidalgo Y Castilla, declared Mexican independence from Spain. Ten years later New Spain ceased to exist and the country had adopted an old Aztec name, Mexico. There were numerous building blocks that established Catholicism as the universal religion in Mexico and, by extension, its southwest territories: primarily, Texas, New Mexico, Arizona, Colorado and California. In the early years, the Catholic Church demanded that haciendas (large land ownership) supply a priest for the lay residents. 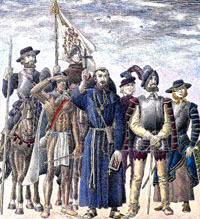 In 1527, Juan de Zumarraga was appointed by the Spanish crown as first bishop of New Spain. (We will now refer to it as Mexico.) He compiled a manual for his clergy and a catechism for the Indians. One convert, Juan Diego, claimed to have witnessed the appearance of a brown Virgin Mary. Word spread and thousands of Indians flocked to the church doors clamoring for baptism. Under this Bishop, the Indians, for the first time, received humane treatment. This conduct brought more converts to the schools established by the bishop and began to bring an understanding of Catholic values. In the next 50 years, Jesuit, Dominican, Augustinian and Franciscan orders had carved out territorial spheres of influence. Missions begun in Mexico spread into the American south west. These missions attracted Indian laborers who quickly realized that they were bound for life to mission precincts. The missions also attracted settlers who relied on the priests for medical treatment and education. The former was essential because the indigenous natives were dying by the thousands from exposure to European diseases. Small Pox took the greatest toll. While missions were established throughout the southwest and California, their success was not repeated in Texas in the early 19th century. The northern provinces, close to the Texas border, were leading the fight for Independence. The combination of the Mexican revolt (1810-1821) and its proximity to Texas, were influencing those Mexicans that emigrated to Texas. While their religion was still important in their lives, their focus was on the shape of political institutions and its effect on the economic hardships that engulfed them. The church in Texas could not offer redress. The clergy was clearly losing its importance. 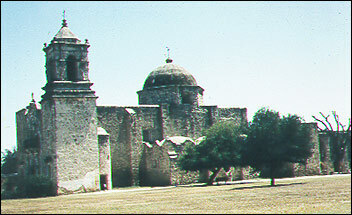 Mission settlements were less attractive even in California where some Mexicans looked for separation from Mexico.The famous San Antonio de Valero, the Alamo, was one of several built along the San Antonio River that had spread the faith, but had out lived its usefulness to Tejanos. Tejanos ( MexicanTexans) were now exposed to Anglo settlers crossing Mexican territorial borders. Different language, different culture and above all different religion were new barriers to interaction between the Mexicans and Americans. Mexicans believed their common religion was essential to their communal lives---birth through death. Americans, mainly loosely attached to some Protestant sect, were less dependent on religion and consequently exhibited a more independent streak. The Church taught Mexicans that Protestants were heretics. Some Americans despised Catholics, and many were fearful of papal interference in civil administration. Shortly after the Mexicans won their independence (1821), the newly installed, central government welcomed American settlers into Texas. The welcome was leavened with two provisos. The American settlers would have to swear loyalty to Mexico and convert to Catholicism. Some leaders complied. Stephen Austin publicly converted, and Sam Houston underwent baptism. How many conversions were for expedience or mere lip service is open to conjecture. However, most settlers had grown up in a Protestant household with strong anti -Catholic feelings. They may have sworn to uphold the Mexican conditions, but it appears to have been more honored in the breach. This was the religious setting that existed between Mexicans and Americans on the eve of the American pressure for Texas independence. A basic mistrust existed between neighbors highlighted by color and differing religious beliefs. If the Catholic church had any significant presence in Texas, it might have diffused the tensions. On the other hand, the American preachers, mainly Baptist, Methodist and Presbyterian, surreptitiously crossed into Texas to save the souls of their faithful and poured more oil onto the existing discord. Bolton, Herbert Eugene. The Padre on Horseback, Loyola University Press, Chicago, 1986. Chipman, Donald E. (1998), Spanish Texas 1519-1821, Austin, Texas: University of Texas Press. Greenleaf, Richard E..Zumarraga and the Mexican Inquisition1536-1543, Washington, 1961.